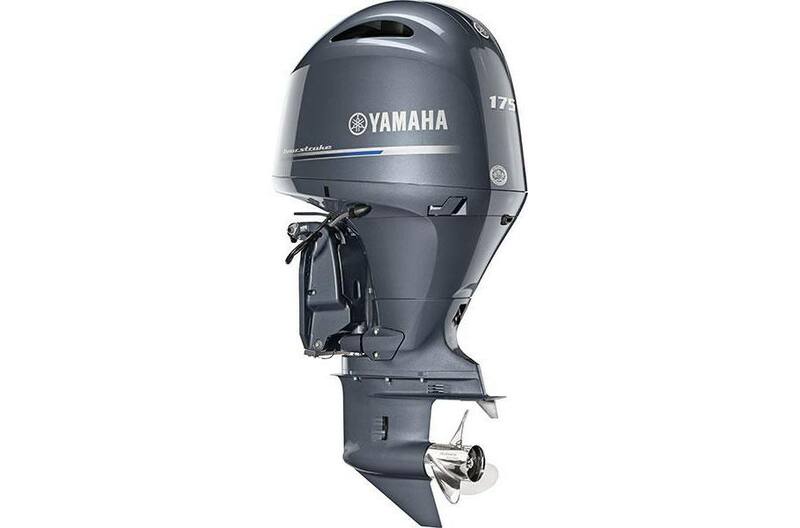 New 2014 Yamaha F175LA four stroke motor. Manufacture date 10/14. Power + Versatility + Reliability for Those Who Know a Good Time -- When They Drive IT. You’re here to wake up the water. Count on Yamaha’s reliable In-Line four strokes to power the fun. Our in-line four-cylinder designs and electronic fuel injection make these babies strong, nimble, compact and light weight. In other words, they’re up for anything, making them the perfect power for cruising, skiing and sport fishing on flats, decks and offshore boats, and pontoons or deep-V hulls. Amazing Acceleration: Variable camshaft timing and four tuned intake tracks increase low-and mid-range torque, boosting acceleration on the F200. Power/Reliability: 16-valve direct drive DOHC maximizes power by using four valves per cylinder, eliminating rocker arms and their adjustments and increasing air supply and volumetric efficiency for better performance on the F200, F175, F150 and F115. Exceptional Performance: Our In-Line Four family features electronic fuel injection controlled by the Engine Control Module. It continually adjusts the fuel/air mix to properly match engine load and speed. Minimized Vibration: Counterbalancing technology on the F200, F175, F150 and F115 minimize engine vibration for a smooth ride. Smart Design: Compact and lightweight, our in-line four-cylinder design is quiet, clean-burning and fuel efficient, with power to spare. Power & Efficiency: A 16-Valve Double Overhead Cam with individual intake and exhaust camshafts provides more precise valve timing control and has less moving parts for less maintenance. This superior design also allows for use of four compact valves per cylinder, which exchanges intake and exhaust gases more efficiently for better power and increased fuel economy. Fuel Economy: Multi-Point Electronic Fuel Injection is controlled by the ECM (Engine Control Module). Four individual fuel injectors provide the precise amount of fuel for each individual cylinder. Optimal fuel atomization provides better combustion, further enhancing performance and fuel economy. Acceleration: A 10mm Offset Crankshaft allows for larger intake volume design. Four tuned intake tubes boost torque in low and mid-speed ranges for quick acceleration. Optimum Overall Performance: Microcomputer Ignition adjusts timing to maintain optimum engine performance, economy and power under all operating conditions. Ultra-Low Emissions: All Yamaha In-Line Four strokes are California Air Resources Board (C.A.R.B.) Three-Star Rated for Ultra-Low Emissions and meet all federal EPA requirements. Corrosion Resistance: Combined with our proprietary alloy (YDC-30), our exclusive Phaze Five™ electro-deposited, anti-corrosive paint system provides a tough, five-layer barrier against corrosion. This protection is standard on all Yamaha inline four stroke engines. Anti-Corrosive Barrier: Our exclusive YDC-30 Alloy is the most corrosion-resistant base material in the industry. Used with our exclusive Phaze Five™ electro-deposited, anti-corrosive paint process provides an extra-tough barrier against corrosion. This protection is standard on all Yamaha inline four strokes. Smooth Operation: Unique Twin counter-balancing technology counteracts vibration normally associated with internal moving parts for smooth operation and a pleasant boating experience. Ergonomic Control: Yamaha’s award-winning, Multi-Function Tiller Handle (optional only on the F115) features Variable Trolling Speed (VTS™), allowing you to fine-tune your trolling speed in 50-RPM increments with the touch of a button. Power Trim and Tilt is positioned next to the twist grip for easy, ergonomic control. Fewer Fill-ups: Yamaha’s In-Line Four strokes blend fuel economy with power and performance. Degree of Tilt: 70 deg. Degree of Trim: -4 deg. through +16 deg.